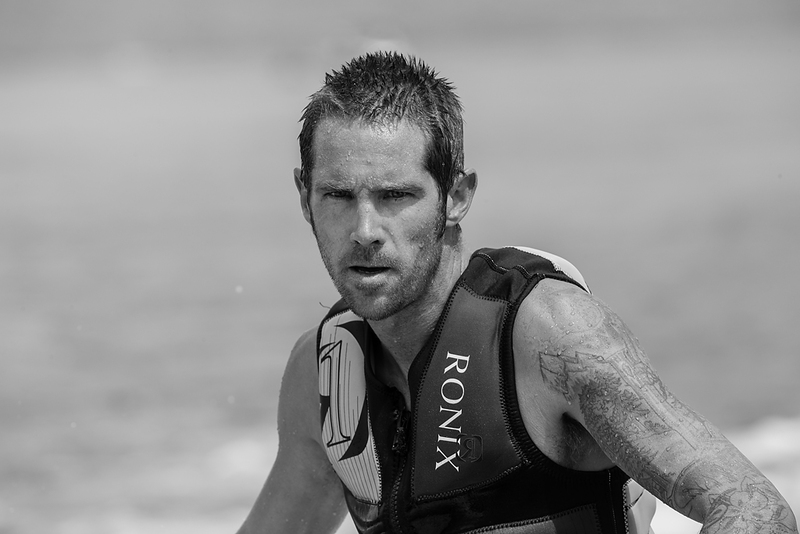 The aim was to produce a picture of wake boarder, Blane, that highlighted the athlete as well as the skills in the sport. 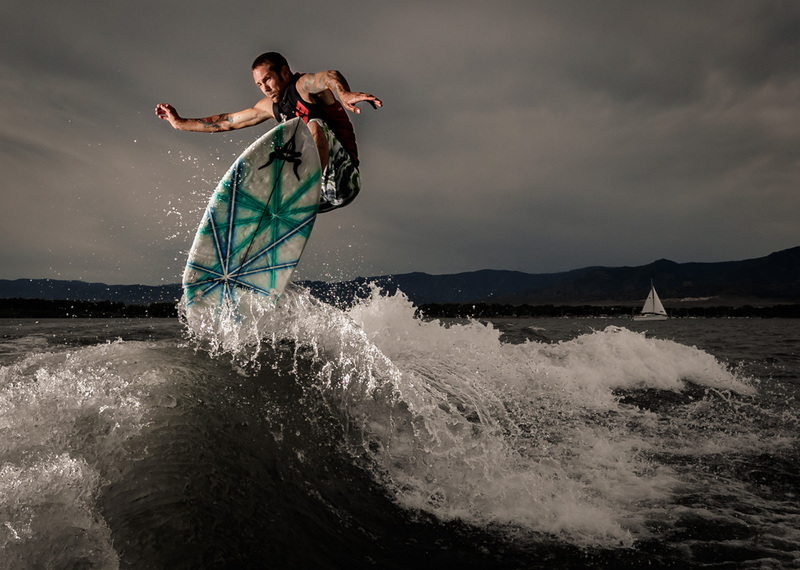 This is an image taken by Scott Taetsch from the back of the wave surfing boat at Chatfiield Reservoir. It’s a good image but the next images show how with a second boat and lights it can be shaped into a great photo. 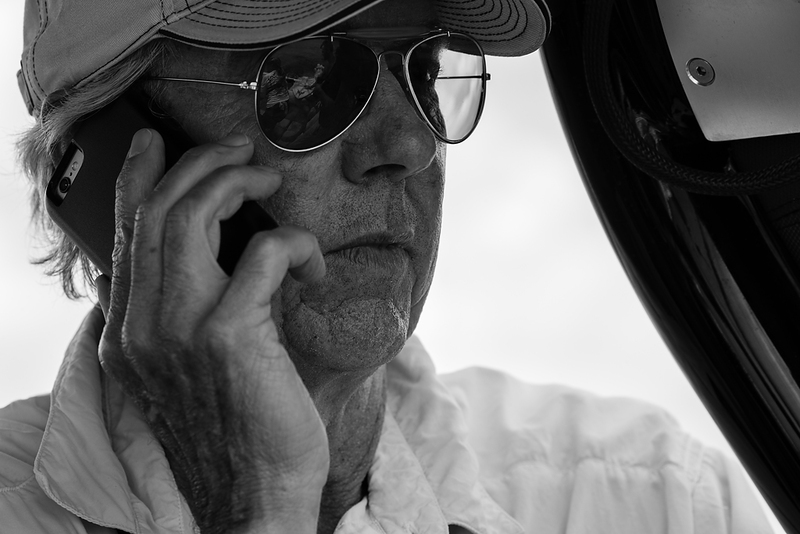 Dave Black is a USA photographer and a veteran of 12 Olympics. His photographic cv includes some of sports most iconic images. 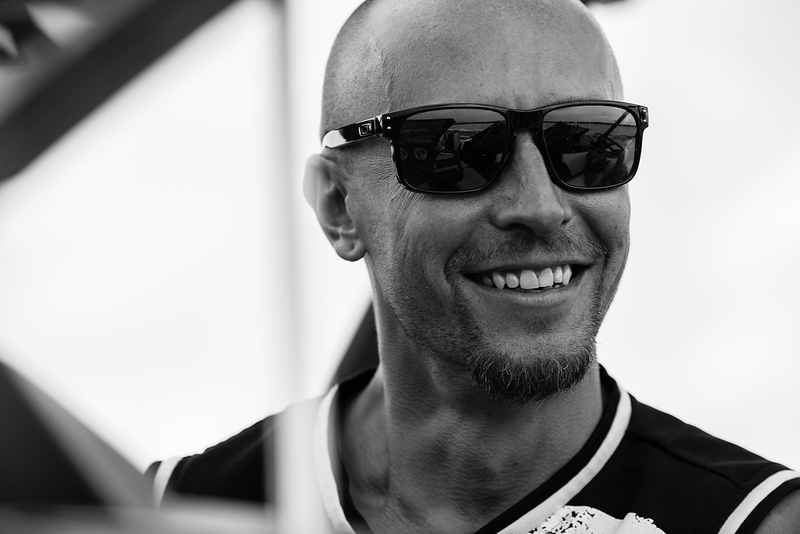 The athlete, Blane, runs his own company that teaches wake surfing and wake boarding, a former snow board competitor and also a talented wake boarder. Joe, another wake boarder, took the helm of the tow boat. Amber helmed the chase boat and had the harder task of holding station of the stern quarter of the tow boat, at around 30feet separation. 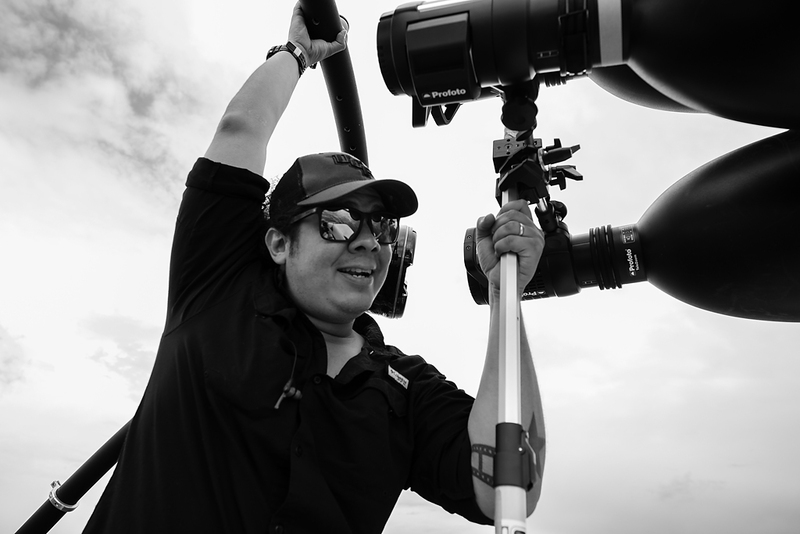 Julio Aguliar, another USA based sports photographer, was in the chase boats with the lights. And finally Scott (left), a photographer based in Washington DC who took the final image. The bit of a wake boarding boat you don’t see. Standard prop and rudder but the vertical plate (top right) is what forces the enlarged wake aided by water being forced through the jets set up above the prop. The tow boat with Blane at the helm and a number of photographers on board. 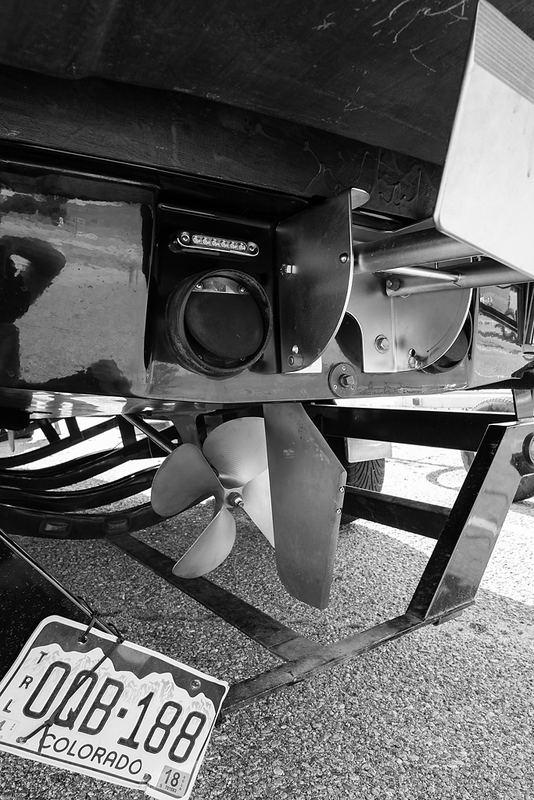 The boat can be set to a fixed speed. In this shot Aaron is on the board in the wake. The chase boat had the lights in the stern; three Profoto B1s fixed to a painter’s pole. 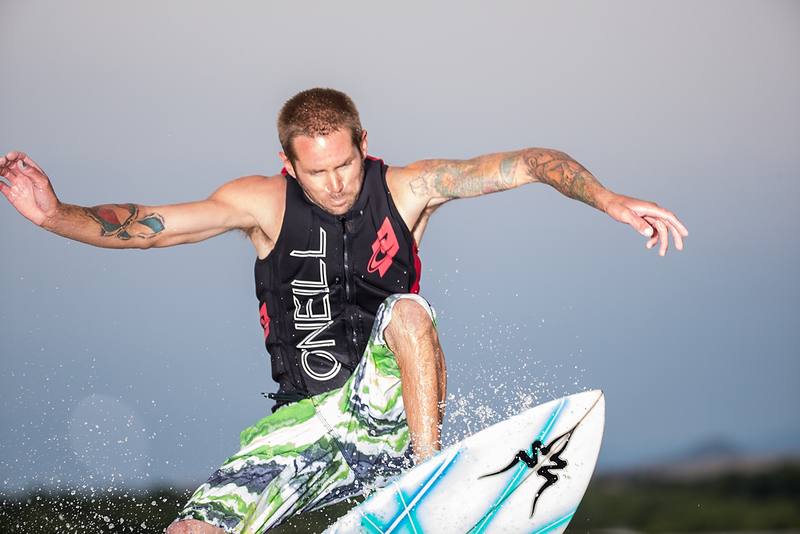 The original plan was to shoot wake boarding as it had the opportunity for better aerials. However it was tight to get the two boats close enough together due to their wash so Blane moved to surfing close in at the back of the chase boat. Julio had the task of directing the light whilst having a fairly bumpy ride. Miker (another of the Wake Boarding team) providing additional support by keeping hold of Julio’s belt to ensure that he could concentrate of light direction. Flat light from over cast skies and a fairly tight image shows Blane’s concentration as he gets the board working on the wake. During the same run a similar image illuminating from behind the camera. Adds to the image but is still a little flat. This is because I was shooting from the chase boat. Scott in the tow boat had the light illuminating from the side which should give more tone and depth to the lighting. The final shot. 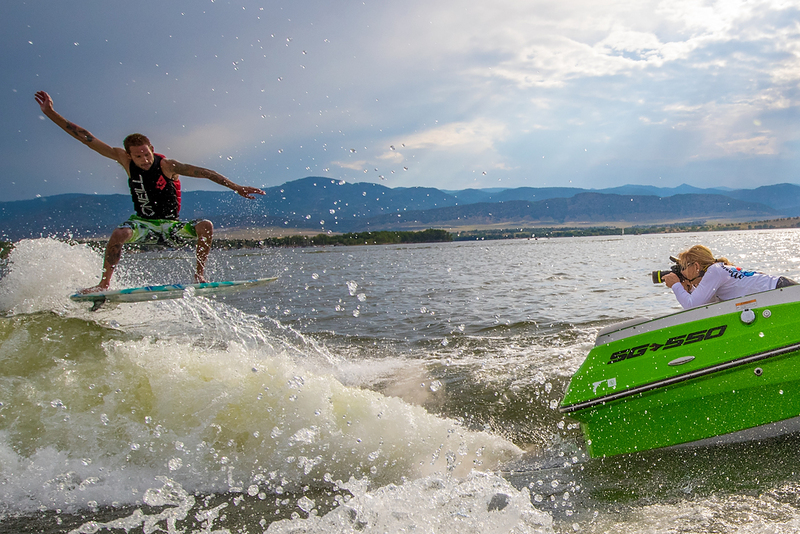 Scott hanging low over the tow boat shooting single frame, catches the action as Blane lips of the top of the wake. 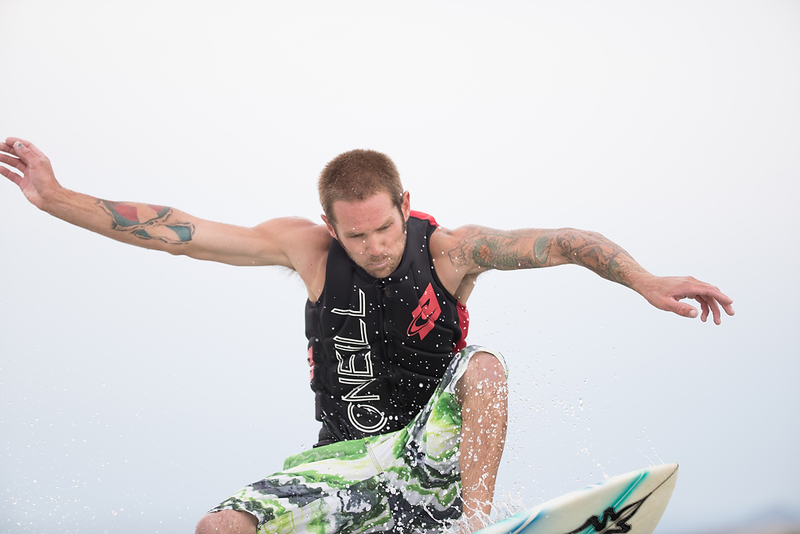 The light catches the wake, the underside of the board and brings detail and texture to Blane’s arms and face. Quite a team effort but produced an excellent shot highlighting the athlete and the sport. 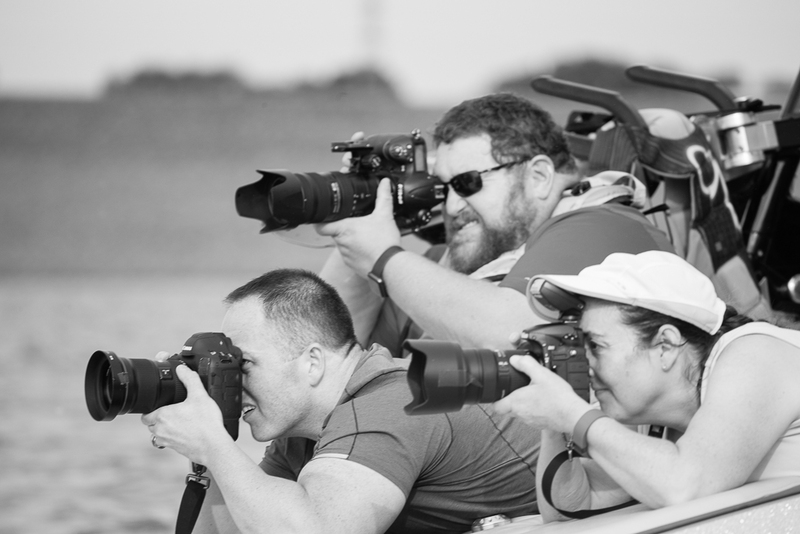 This photo story was taken from behind the scenes of a Sports and Event Photography workshop provided by Summit Workshops. 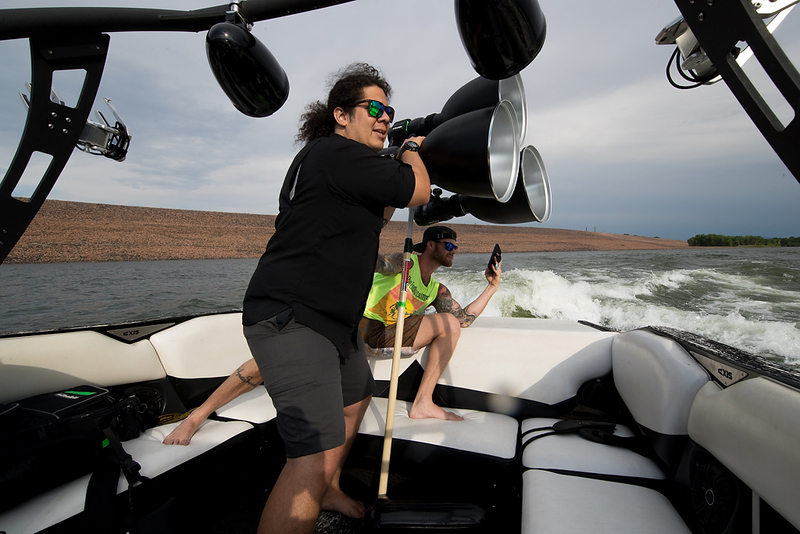 I was shooting with a Canon 1DXMkII, Canon EF200-400 F4 L, Canon EF11-24 F4 L. Space on the boat was limited so my Think Tank Airport International was left ashore but I used my Think Tank Speed Changer to keep my gear cleaning kit (spray was a problem) and my wide angle lens to hand. Which memory card was this shot on? I had two cards in the back of the Canon 1DXMkII with camera set to write to both cards. Slot one had a Lexar Professional 800x 32GB CF card whilst in slot 2 I had the SanDisk Extreme Pro 64GB CFast 2.0 card. The images were taken from slot two which is my working card with slot one being used as insurance in case of writing problems. Really nice work Geraint! So glad I had the chance to talk with you in Denver. Glad you enjoyed it and yes great to share experiences in Denver. Will long last in the memory. Awesome write-up and behind the scenes photos, Geraint! Was great to meet you and your wife. Have a safe trip home. Cheers Scott. Leaving today home tomorrow afternoon. Will be in touch when back on Skye.